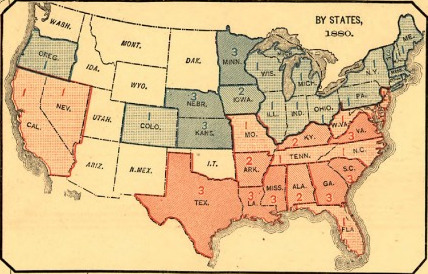 Scribners 1880 Popular Vote	(www.mappingthenation.com). About 7,000 records of donations between Minnesota groups are incorrect — an error rate of about one in seven. Electronic records dating to 2001 show that such groups may have donated as much as $143 million or as little as $122 million. The flaws are enough to hamper any comprehensive attempt to examine the flow of political money in the state, at a time when that spending has soared to record heights. 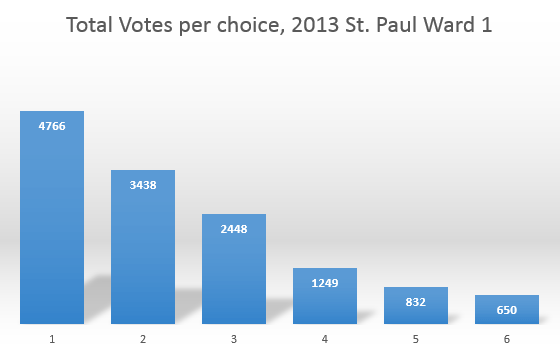 ♣ On Monday the ballots were ranked according to choices in the race for the Ward 1 seat on the St. Paul City council. Dai Thao defeated Noel Nix 1970-1722, or 41%-36%. You can see that by the time we get to third choices, there are only about half the number of first choices. And going from third to forth is another halfing. Only 25% of voters to cast ballots in this election took advantage of the forth choice option that they wouldn’t have gotten in Minneapolis. And for every round there is a not insignificant drop-off. It doesn’t really do any good to allow people to rank all the choices if they don’t rank all the choices. Marty Seifert, a Republican candidate for governor in 2010, will give it another try: He plans to announce Nov. 21 that will seek the GOP endorsement for governor, sources confirm. If you recall last weeks Wrap, there was an item indicating that this announcement would come on the 18th, or tomorrow. The 21st is not the 18th though. So this is a new thing! After a whole timeline of sporadic tweeting, Marty Seifert has been quite active over the past few days. According to multiple sources, State Senator Julie Rosen has decided against running for governor in 2014. Dan Wolgamott, a 23-year-old DFL activist from St. Cloud, says he’s running for the state House seat now held by GOP Rep. Tama Theis. Wolgamott, a real estate agent and football coach at Sauk Rapids-Rice High School, has a track record in local DFL politics. He managed former Rep. Larry Hosch’s campaign in 2010 and also worked for the campaigns of Rep. Zachary Dorholt in 2012 and Joanne Dorsher, whom Theis beat in a special election earlier this year. As indicated in the above quoted text, 14A is currently held by GOP Representative Tama Theis (14A), who won her seat in a February bonus election 55%-43%, a similar outcome to the 54%-46% that former Rep. Steve Gottwalt received in the November regular election. The district’s hPVI though is only R+3, territory very much within reach for the DFL, and an indication that the district may be slightly more winnable than the past legislative results would indicate. Rep. Andrea Kieffer has decided against seeking re-election to her Woodbury seat. Two names quickly emerged to replace Keiffer on the GOP side. First is MN GOP Deputy Chair Kelly Fenton the other is former Mrs. Minnesota Kelly Jahner-Byrne who was also then Secy. of State Mary Kiffmeyer’s 2002 campaign manager. Kelly Fenton of Woodbury is seeking the seat being vacated by Rep. Andrea Kieffer, R-Woodbury. 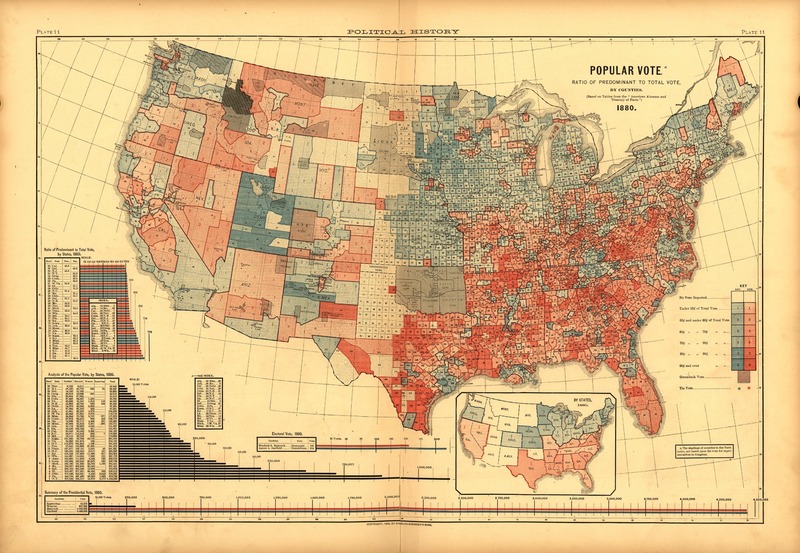 Not much has changed in the preceding 130 years, well not much except for the fact that this map uses the color red to identify the Democratic party and the color blue to identify the Republican party. So everything has in fact changed. 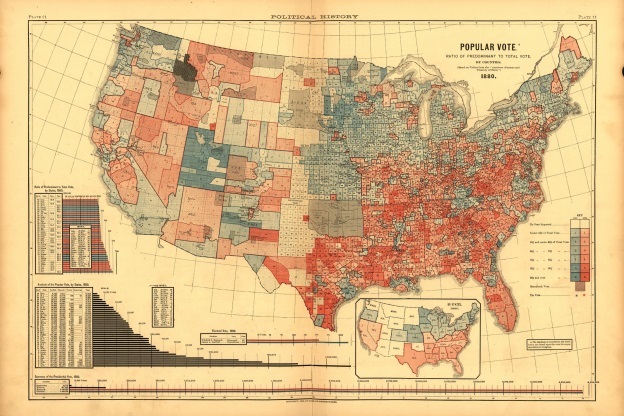 It’s an endlessly facsinating map though, so follow the link and check out the full-sized version.